Mapping the Cold War: Cartography and the Framing of America’s International Power. Chapel Hill: University of North Carolina Press, 2015. 322 p. $29.95. Mr. Barney’s work provides a scholarly text-driven narrative of geopolitical worldviews as reflected in, and influenced by a select group of cartographers working in U.S. government and the commercial publishing industry. 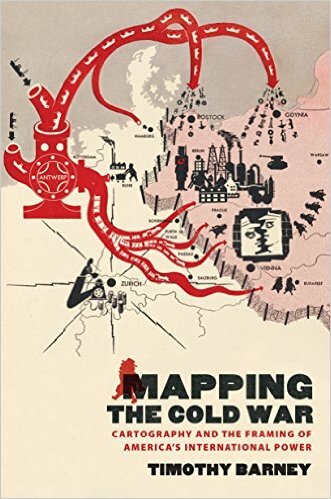 He writes “for the purposes of this book, cartography is not a by-product of the Cold War, it is Cold War history” and to understand it is by looking at the deeper discursive connections of the maps. The work spans the era from the beginnings of World War II through a Bush-Gorbachev summit in 1989: an era dominated by Cold War anxiety, nuclear fears, U.S.-Soviet rivalry and competition for “Third World” influence. The first chapter “Iron albatross : air-age globalism and the bird’s-eye view of American internationalism” describes the 1940s thru early 1950s work of Fortune magazine cartographer Richard Edes Harrison whose unconventional “birds eye” or “world from above” perspectives reflected a new-found era of “air age globalism,” enlightened by the novelty of polar routes, no longer bound by the dominant north/south orientation or rectangular Mercator projections. The second chapter “One world or two? : mapping a new foreign policy in the transition to Cold War” focuses on the channeling of the air-age global dynamic into State Department world perspectives, chiefly directed by S.W. Boggs, its official cartographer. Chapter 3, “Images of commitment and evidentiary weapons: maps and the visual construction of the Soviet Union” details how cartography helped in the creation of an East-West dichotomy: with maps becoming “evidentiary weapons” to incite public opinion. Cartographic perspectives from Time, Life, Fortune and other publications helped further the aims of Congressional investigations into “un-American activities”. As the “Free World” “Communist World” dichotomy evolves, at the same time the great de-colonization of the former empires and subsequent non-alignments the West coins the concept of the “Third World:” poor, vulnerable and ripe for the swaying into a Western orbit. American strategies to gain influence are described in Chapter 4, “Framing the Third World : American visions of ‘the South’ and the cartography of development”. In this chapter the author examines how mapping became limited by East/West, North/South and “Third World” constructs. The anti-war scholarship of cartographer William Bunge and his Nuclear War Atlas is used to contextualize a famous 1984 debate between then Secretary of Defense Caspar Weinberger and another anti-war activist at Oxford University in Chapter 5, “End of cartography: state control and radical change in the nuclear geopolitics of the Second Cold War”. Backed by extensive footnotes, bibliography, and index, the work contains 24 black and white map illustrations supporting the narrative. The author’s discourse, as indicated by the books sub-title, “Framing of America’s International Power” reflects a U.S. perspective and as such all illustrations are from an American viewpoint (except one Soviet authored map that uses an American base map). The lack of color is unfortunate, but due to cost, understandable. But I was able to find many color representations of the author’s cartographers in internet searches, which help deliver the author’s analysis more effectively. Mr. Barney is an Assistant Professor of Rhetoric and Communication Studies at the University of Richmond, Virginia and has written numerous articles on rhetoric, cartography and the Cold War. Mr. Barney’s book is quite informative, scholarly yet fun read for those interested in the Cold War.